Chris McGrath/Getty ImagesPeople hold posters of Saudi journalist Jamal Khashoggi during a protest organised by members of the Turkish-Arabic Media Association at the entrance to Saudi Arabia’s consulate in Istanbul, Turkey. Meshal Saad al-Bostani, named by pro-government Turkish media as one of 15 men suspected of killing the Saudi critic Jamal Khashoggi, died in a car accident in Riyadh, according to a report from a pro-government newspaper. The newspaper has had a lot of scoops from anonymous Turkish officials on the Khashoggi case. Turkish officials have leaked information to Turkish and US publications but do not appear to have provided key evidence to US intelligence services. Saudi Arabia has exceptionally high rates of car accidents and fatalities. Here’s everything we know about Khashoggi’s troubling disappearance. Meshal Saad al-Bostani of the Saudi Royal Air Force, who was named by pro-government Turkish media as one of 15 men suspected of killing the Saudi critic Jamal Khashoggi, reportedly died in a car accident in Riyadh. An article titled “Riyadh Silenced Someone” from Yeni Safak, a Turkish newspaper that strongly supports Turkish President Recep Tayyip Erdogan, said the man died in a car crash, without giving a specific time or location. Yeni Safak has been a major voice in coverage of Khashoggi’s disappearance, with daily scoops citing unnamed Turkish officials giving gory details about what they allege was a murder within the Saudi Consulate on October 2. Saudi Arabia has denied any knowledge of Khashoggi’s whereabouts or disappearance, but US intelligence officials have started to echo the view that the prominent Saudi critic, who recently took residence in the US, was killed. In particular, Yeni Safak has said it heard an audio tape of Khashoggi’s killing, but Turkish intelligence does not appear to have turned over such a tape to the US. The US and Turkey are NATO allies with extensive intelligence-sharing agreements. The Committee to Protect Journalists said in a report last year that Turkey was the world’s biggest jailer of journalists, and there are few independent voices in its media scene. 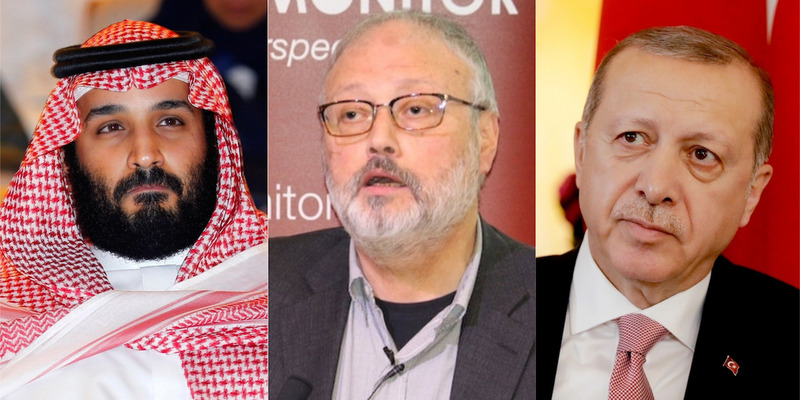 Hamad I Mohammed/Reuters; Middle East Monitor via Reuters; Matt Dunham – WPA Pool/Getty ImagesSaudi Crown Prince Mohammed bin Salman, Khashoggi, and Turkish President Recep Tayyip Erdogan. “Let’s be honest,” Democrat Sen. Chris Murphy of Connecticut told Business Insider on Wednesday, “the Turks have leaked some pretty serious allegations through the press that they have not been willing to make public. There are not a lot of clean hands. Meanwhile, Trump has suggested that “rogue killers,” not Saudi leadership, took out Khashoggi. CNN and The New York Times on Monday also reported that Saudi Arabia was preparing an alibi that would acknowledge that Khashoggi was killed. But no Saudi alibi has emerged. After a trip to Saudi Arabia this week, US Secretary of State Mike Pompeo said the Saudis didn’t want to discuss the facts of the case but would investigate and hold any guilty parties accountable.